NEW YORK -- A 45-foot (13.7-meter) inflatable ballerina created by artist Jeff Koons is the latest public art installation at New York's Rockefeller Center. The work, "Seated Ballerina," was unveiled Friday and will be on display through June 2. The nylon sculpture is based on a porcelain figurine of a ballerina in a blue tutu. Koons said the work "conveys optimism and a sense of potential for the future." He said the sculpture is intended to bring awareness to National Missing Children's Month. 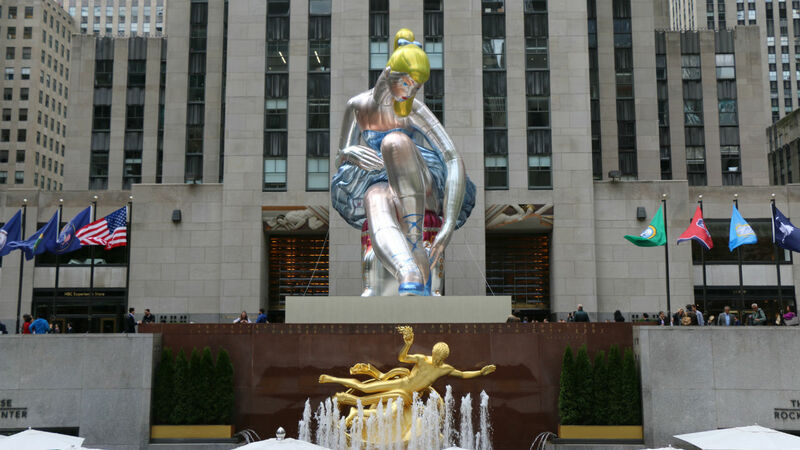 "Seated Ballerina" is the third Koons work to take up residence at Rockefeller Center in midtown Manhattan. The artist's "Puppy" was installed there in 1992 and "Split-Rocker" in 2000. Rockefeller Center officials say "Seated Ballerina" will be deflated for safety reasons during inclement weather. Make sure to see her for yourself before June 2, and as always, send us your photos using #abc7ny.